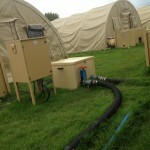 ATAC Solutions are proud to be involved in the construction of an Olympic Security Camp for the UK Military. ATAC were given the task of providing water and wastewater facilities to aid the camps infrastructure for the security staff for the Olympic Games and with such a short time frame ATAC successfully completed the race!! 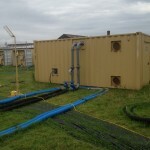 Andrew Turnill (Engineering Director) stated that ” The performance of the team involved in the design and construction acted professionally and used great skill to provide the camp with suitable water, wastewater treatment and general infrastructure to aid the construction of the complete camp”. With ATAC’s expertise in temporary treatment and project management the Olympics now has a touch of ATAC’s magic to aid a successful games….Good Luck Great Britain.